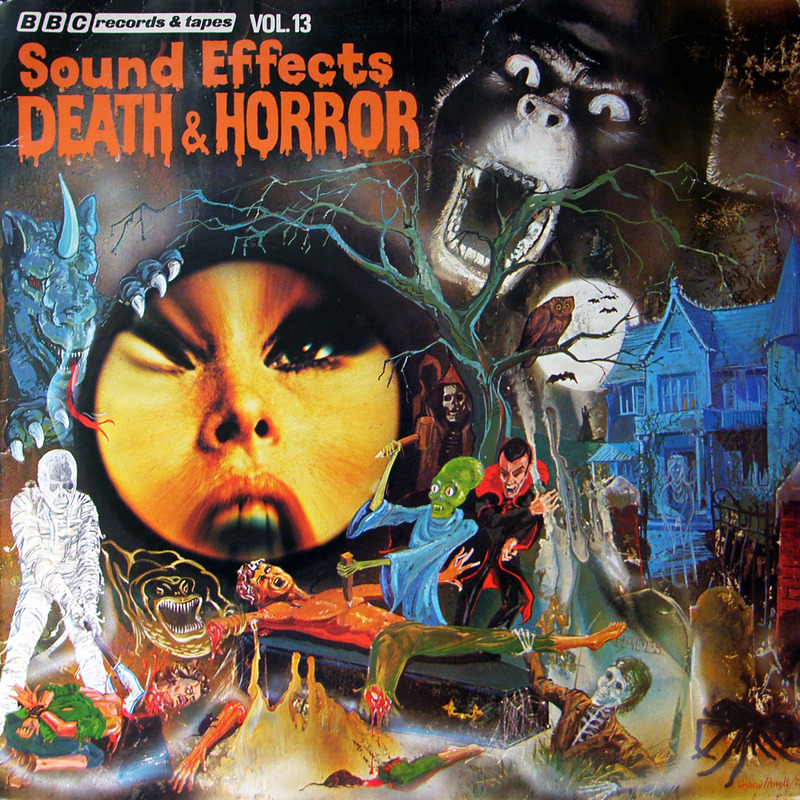 There were three horror-themed LPs in the BBC’s long-running sound effects series: Sound Effects: Death & Horror (Vol. 13, 1977), More Death and Horror (Vol. 21, 1978), and Even More Death and Horror (Vol. 27, 1982). Some editions of the second title (Vol. 21) were released “in blood red vinyl,” as advertised on the LP cover. These are not, you may have guessed, your standard “chilling sounds,” including tracks such as “Arm Chopped Off,” “Red Hot Poker Into Eye,” “Death By Garrotting,” “Body Put Into the Acid Bath,” and “Self Immolation,” to name just a few. The gruesome cover art on the first two records is by Andrew Prewitt, who talks about the project at Horrorpedia, where you’ll find a good write-up. 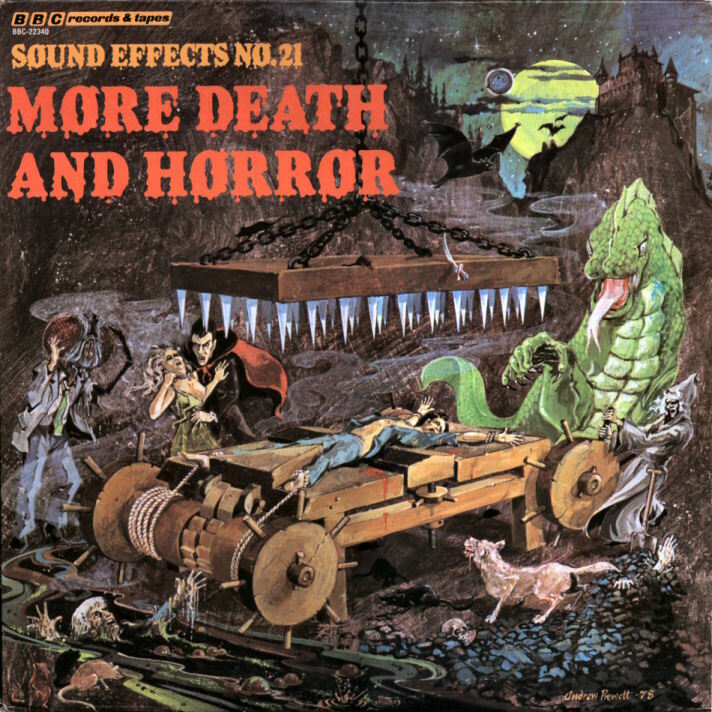 Many of the sound effects on the albums are available on iTunes. 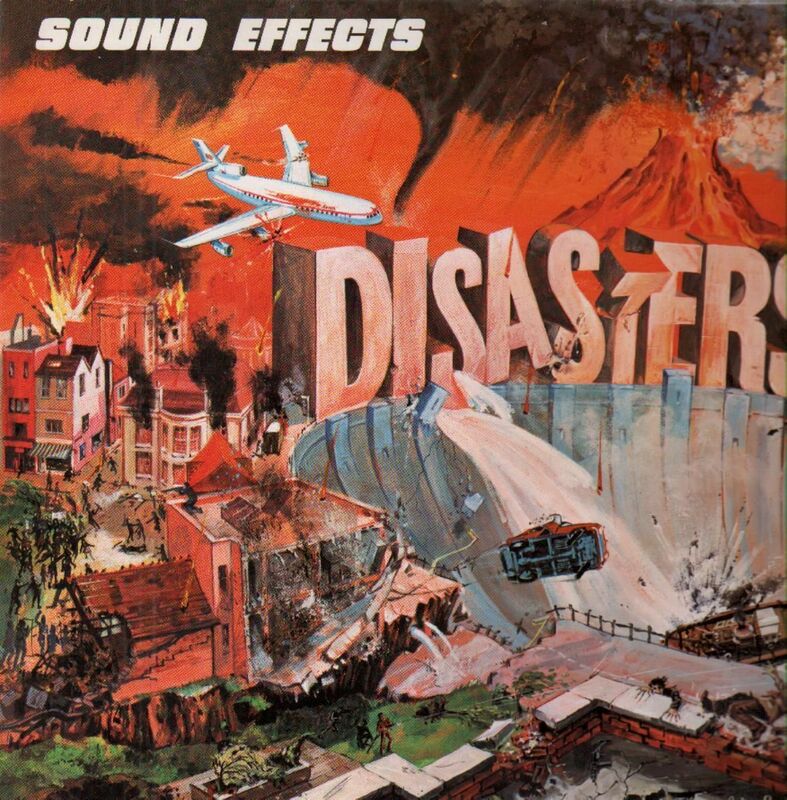 There are lots of other interesting volumes in the BBC sound effects series, including Disasters (Vol. 16, 1977)—“Erupting Volcano With Lava Whooses,” “Radioactive Burn,” “Reprisal Air Strike,” etc.—and the extraordinary Out of This World (1976), a compendium of sci-fi, fantasy, and “supernatural” atmospherics. Hewitt did the covers (below) for those volumes as well. The little information I have came from Nightcoaster and The Internet Museum of Flexi/Cardboard/Oddity Records. The video is via homersoddishe/YouTube. 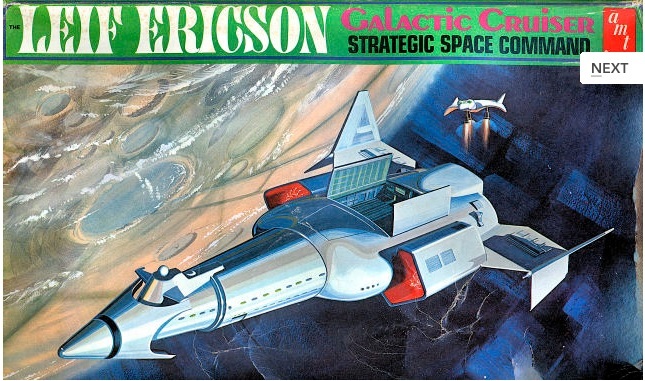 UPDATE: Many thanks to Gordon Peterson, who identified the spaceship model as AMT’s Leif Ericson Galactic Cruiser. David Penn and Scott Snell did an amazing job of identifying both the source of the music and the spoken words in the record. The lyrics are from a 1967 psychedelic rock record called “Cosmic Sounds” by The Zodiac. The music was originally used in “The Twilight Zone” and was released in “The Twilight Zone: 40th Anniversary Collection” set. I’m listening to Cosmic Sounds right now. Like, it’s out there, man. Share the journey of a 5 billion mile trek to the outer limits of our solar system. Hear the beautiful songs of the planets. The complex interactions of the cosmic plasma of the universe, charged electromagnetic particles from the solar wind, planetary magnetosphere, rings and moons create vibration “soundscapes” which are at once utterly alien and deeply familiar to the ear. Some of these sounds are hauntingly like human voices singing, giant Tibetan bowls, wind, waves, birds and dolphins. Many are familiar in a way unique for each listener. Voyager has left our Solar System forever. The sounds on this recording will never be made again in our lifetime. 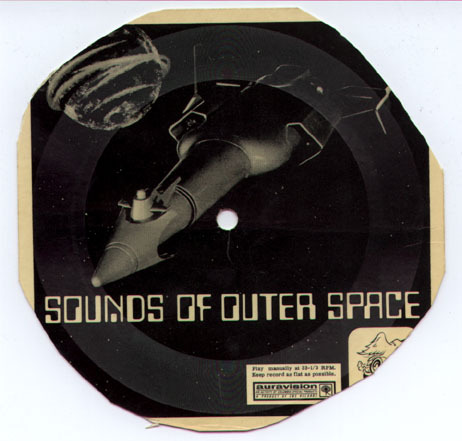 is dedicated to the memory of Fred Scarf, PhD, who developed the acoustic recording project for Voyager and is directly responsible for the sounds you hear on these recordings from space. Dr. Fred Scarf happens to be the real deal. According to a 1981 Christian Science Monitor article (“Voyager 2 sending back eerie ‘music of the spheres’“), Scarf developed the plasma wave detector on Voyager 2 and “rigged up a microcomputer and music synthesizer to turn the noise of space and planets into a `Star Wars’-style siren song.” His 1988 obituary in the Los Angeles Times confirms this. 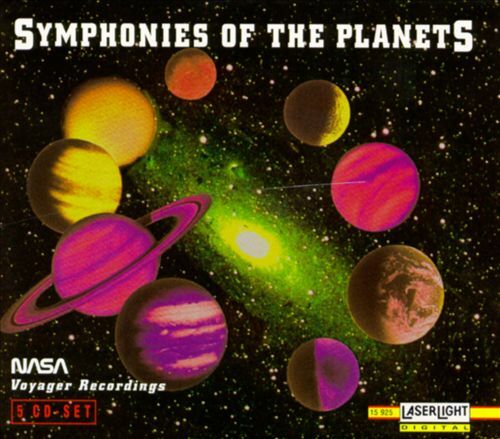 However, I can’t find any confirmation on NASA’s site or anywhere else that the sounds on Symphonies of the Planets were supplied and/or endorsed by NASA and/or Scarf. I did find some raw Voyager and Cassini recordings at NASA, prefaced by the remark that “Some spacecraft have instruments capable of capturing radio emissions. When scientists convert these to sound waves, the results are eerie to hear.” So, in theory, the sounds synthesized on the Symphonies disc(s) really could be from Voyager. But are they? I’ve emailed NASA about it via its public inquiry address. We’ll see what happens. I do find a starkness and a uniqueness in all of the different “soundscapes,” but that could very well be my mind clinging to the notion that they were captured by 35-year-old probes that have sailed past our solar system and are currently on the verge of interstellar space. Martin Denny’s first album, 1957’s Exotica, spawned a genre of the same name based on “what a lot of people imagined the [South Pacific] islands to be like.” He described it as “pure fantasy,” which is really the foundation of all lounge music: the musical evocation, by non-natives, of exotic and fantastic locations. Exotic Moog, released in ’69, is a reinterpretation of 12 standards using the Moog (early synthesizer). The album is totally out there and incredibly hard to find. The few songs I’ve come across make me feel like I’m drifting drowsily through space in an abandoned tiki bar. In other words, I’m a big fan. EDIT (1/17/13): I’ve now found 7 of the 12 songs on the album and made up a playlist. Enjoy. Dig these trippy sci-fi tunes, man. I’ve been listening to Leonard Nimoy jams on Spotify (Spaced Out: The Best of Leonard Nimoy and William Shatner) and loving every minute of it. Nimoy put out several albums in the ’60s, the first one (and half of the second one) in his Mr. Spock persona. You can listen to many of the tracks via Synthasia. If you dig this, then you absolutely must check out Song of the Second Moon, by Thomas Dissevelt and Kid Baltan. 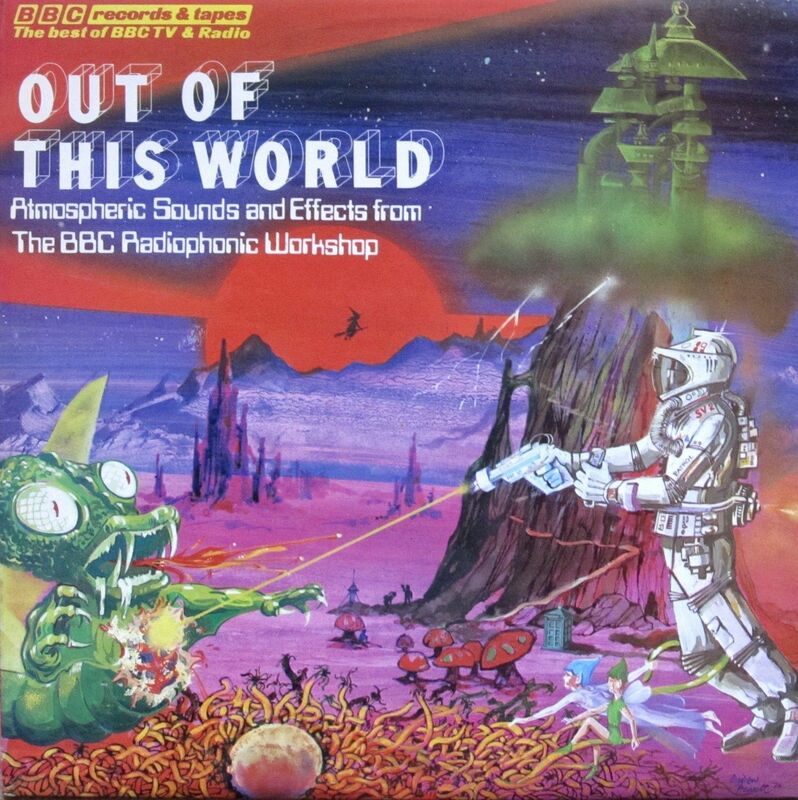 The album was originally released in 1957 and is considered the first popular synth/electronica album: “The soundtrack to a charming and utopian future (that has yet to arrive).” I just bought the 2012 reissue, but have a listen courtesy of manfromuranus.